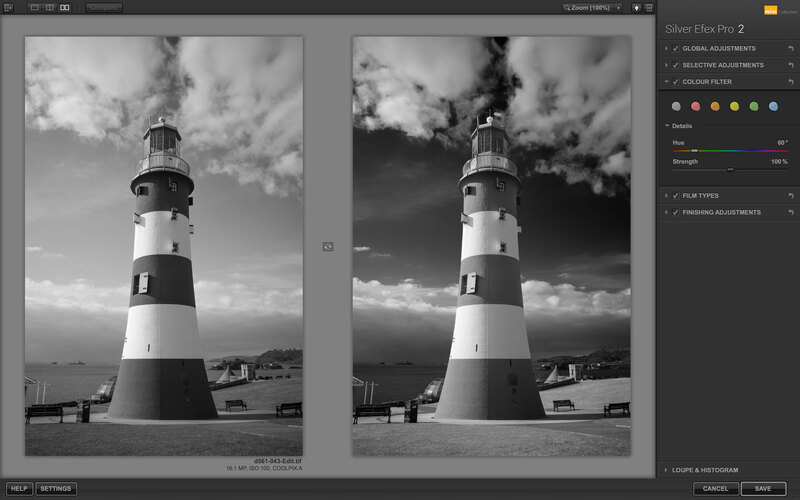 Why would you use colour filters when you’re shooting in black and white? It’s so that you can control the way different colours translate into shades of grey. For example, if you shoot through a red filter, it blocks colours other than red, so that opposite colours, like blue skies, for example, come out much darker in the black and white image. Red filters give very dramatic dark skies (as long as they’re blue, not a neutral grey) and create strong contrast in bright sunlight, yellow filters make blue skies darker and foliage lighter (foliage contains a lot of yellow, not just green) and orange filters are somewhere in between. Blue filters don’t have a particularly nice effect generally, but they are similar to old ‘orthochromatic’ black and white film, which is sensitive to every colour except red. So you can still use these black and white filters, also called ‘contrast’ filters, with a digital camera, but there’s not a lot of point because you get the same results and much more control if you shoot in colour and apply a filter digitally. Practically any program that converts colour images to black and white can simulate these filters, but I’m using Silver Efex Pro (part of the Google Nik Collection) because it offers more control than most and good results even with strong filter effects – this introduces technical issues as I’ll explain shortly. Here’s a before-and-after comparison. 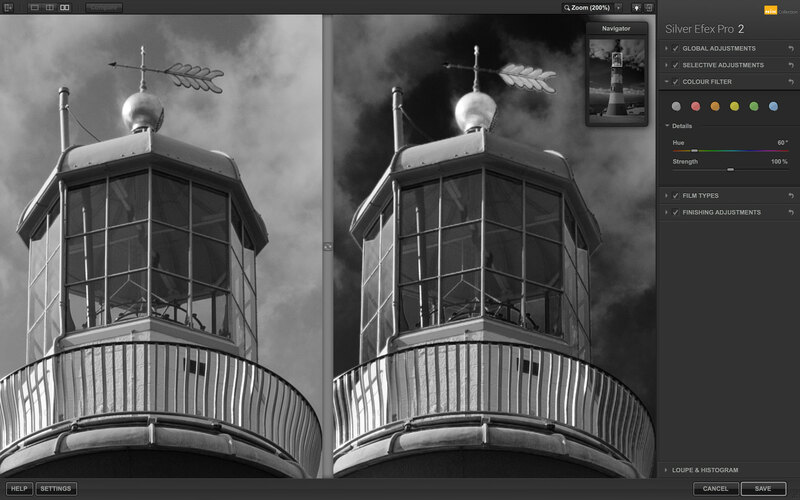 The shot on the left is a straight, ‘unfiltered’ black and white conversion; the one on the right has a strong yellow filter effect. I tried the red filter first but it lightened the red bands on the lighthouse too much compared to the rest of the picture. The orange filter was only slightly better and it was the yellow filter that gave the best result. From there it was just a case of increasing the Strength value to get just the right contrast between the sky, the grass and the tower. Manipulating the different colour channels can create digital artefacts, especially if you rely heavily on the most useful red, orange and yellow filters. They exaggerate the red channel in the colour image, which exaggerates the noise and artefacts in that channel. You can see in this blow-up that the weather vane on the top of the tower is looking a little hazy around the edges and there’s a narrow edge ‘halo’ effect around the right side of the tower. Artefacts like these are largely inevitable with heavy black and white filter effects, but Silver Efex Pro controls them very well – on reason why it’s my favourite black and white tool.